“Cure” is a word that’s dominated the rhetoric in the war on cancer for decades. But it’s a word that medical professionals tend to avoid. While the American Cancer Society reports that cancer treatment has improved markedly over the decades and the five-year survival rate is impressively high for many cancers, oncologists still refrain from declaring their cancer-free patients cured. Why? Patients are declared cancer-free (also called complete remission) when there are no more signs of detectable disease. However, minuscule clusters of cancer cells below the detection level can remain in a patient’s body after treatment. Moreover, such small clusters of straggler cells may undergo metastasis, where they escape from the initial tumor into the bloodstream and ultimately settle in a distant site, often a vital organ such as the lungs, liver or brain. When a colony of these metastatic cells reaches a detectable size, the patient is diagnosed with recurrent metastatic cancer. About one in three breast cancer patients diagnosed with early-stage cancer later develop metastatic disease, usually within five years of initial remission. By the time metastatic cancer becomes evident, it is much more difficult to treat than when it was originally diagnosed. What if these metastatic cells could be detected earlier, before they established a “foothold” in a vital organ? Better yet, could these metastatic cancer cells be intercepted, preventing them them from lodging in a vital organ in the first place? 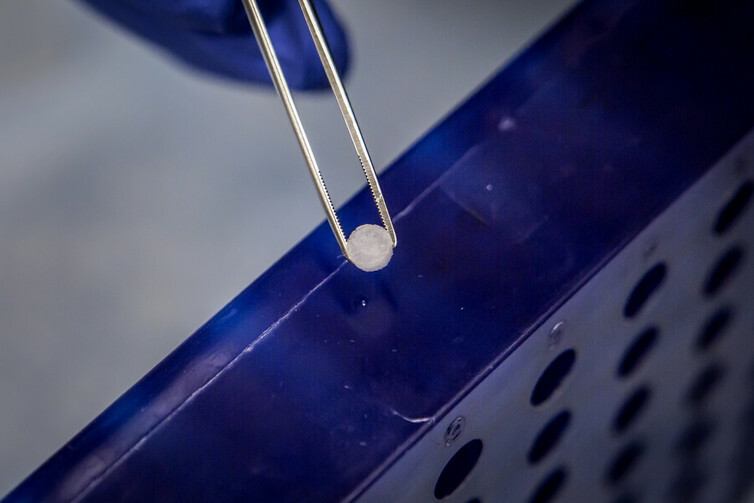 With these goals in mind, our biomaterials lab joined forces with surgical oncologist Jacqueline Jeruss to create an implantable medical device that acts as a metastatic cancer cell trap. The implant is a tiny porous polymer disc (basically a miniature sponge, no larger than a pencil eraser) that can be inserted just under a patient’s skin. Implantation triggers the immune system’s “foreign body response,” and the implant starts to soak up immune cells that travel to it. If the implant can catch mobile immune cells, then why not mobile metastatic cancer cells? The disc can detect cancer cells in mice. Lab mouse via www.shutterstock.com. We gave implants to mice specially bred to model metastatic breast cancer. When the mice had palpable tumors but no evidence of metastatic disease, the implant was removed and analyzed. Cancer cells were indeed present in the implant, while the other organs (potential destinations for metastatic cells) still appeared clean. This means that the implant can be used to spot previously undetectable metastatic cancer before it takes hold in an organ. For patients with cancer in remission, an implant that can detect tumor cells as they move through the body would be a diagnostic breakthrough. But having to remove it to see if it has captured any cancer cells is not the most convenient or pleasant detection method for human patients. There could be a way around this, though: a special imaging method under development at Northwestern University called Inverse Spectroscopic Optical Coherence Tomography (ISOCT). ISOCT detects molecular-level differences in the way cells in the body scatter light. And when we scan our implant with ISOCT, the light scatter pattern looks different when it’s full of normal cells than when cancer cells are present. In fact, the difference is apparent when even as few as 15 out of the hundreds of thousands of cells in the implant are cancer cells. There’s a catch – ISOCT cannot penetrate deep into tissue. That means it is not a suitable imaging technology for finding metastatic cells buried deep in internal organs. However, when the cancer cell detection implant is located just under the skin, it may be possible to detect cancer cells trapped in it using ISOCT. This could offer an early warning sign that metastatic cells are on the move. This early warning could prompt doctors to monitor their patients more closely or perform additional tests. Conversely, if no cells are detected in the implant, a patient still in remission could be spared from unneeded tests. The ISOCT results show that noninvasive imaging of the implant is feasible. But it’s a method still under development, and thus it’s not widely available. To make scanning easier and more accessible, we’re working to adapt more ubiquitous imaging technologies like ultrasound to detect tiny quantities of tumor cells in the implant. Besides providing a way to detect tiny numbers of cancer cells before they can form new tumors in other parts of the body, our implant offers an even more intriguing possibility: diverting metastatic cells away from vital organs, and sequestering them where they cannot cause any damage. In our mouse studies, we found that metastatic cells got caught in the implant before they were apparent in vital organs. When metastatic cells eventually made their way into the organs, the mice with implants still had significantly fewer tumor cells in their organs than implant-free controls. Thus, the implant appears to provide a therapeutic benefit, most likely by taking the metastatic cells it catches out of the circulation, preventing them from lodging anywhere vital. Interestingly, we have not seen cancer cells leave the implant once trapped, or form a secondary tumor in the implant. Ongoing work aims to learn why this is. Whether the cells can stay safely immobilized in the implant or if it would need to be removed periodically will be important questions to answer before the implant could be used in human patients. For now, our work aims to make the implant more effective at drawing and detecting cancer cells. Since we tested the implant with metastatic breast cancer cells, we also want to see if it will work on other types of cancer. Additionally, we’re studying the cells the implant traps, and learning how the implant interacts with the body as a whole. This basic research should give us insight into the process of metastasis and how to treat it. In the future (and it might still be far off), we envision a world where recovering cancer patients can receive a detector implant to stand guard for disease recurrence and prevent it from happening. Perhaps the patient could even scan their implant at home with a smartphone and get treatment early, when the disease burden is low and the available therapies may be more effective. Better yet, perhaps the implant could continually divert all the cancer cells away from vital organs on its own, like Iron Man’s electromagnet that deflects shrapnel from his heart. This solution is still not a “cure.” But it would transform a formidable disease that one out of three cancer survivors would otherwise ultimately die from into a condition with which they could easily live.